Tweet In my first in the series of Holiday Gift Guides, let me just tell you that This Mommy Loves Shutterfly. I've been using Shutterfly since 2002! Holy begeezus that's a long time to be web loyal to a company! You're welcome, Shutterfly. On my 2010 Christmas Shopping List, I include a lot of personalized photo gifts. Here are a few of my favorite items from the past which I've ordered all from Shutterfly. 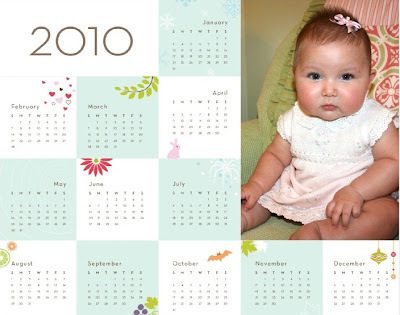 Calendars: I always order 4 calendars, one for each set of Grandparents, the Great Grandmother, and the Great Aunt. This is such a classic go-to gift for family. My favorite design is Flower Market. My favorite thing about ordering calendars is that you can enter all your important dates and quickly insert those into the calendar. All you have to do is enter the dates 1 time, and shutterfly will keep record of all of them. You can choose what dates to insert into what calendar. 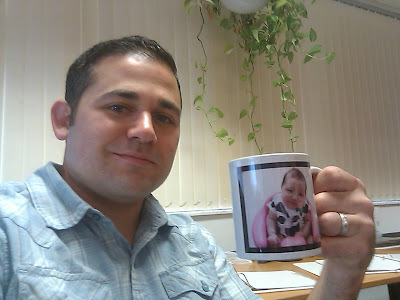 Photo Mugs: I think the Handy Husband said this was his all time favorite gift the first year our daughter was born. It was a way to show her off to everyone at work each day. Desk Calendar: I ordered this last year and didn't realize how big it was, but it is perfect for any family member that might have a glass covered executive style desk. It measures 16" x 20" This is the "Seasons" Design. 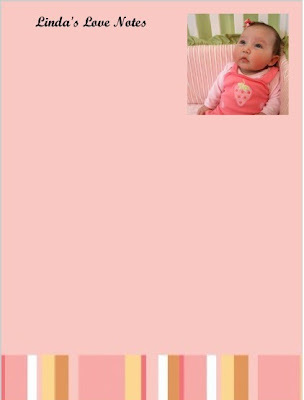 Notepads: I personalized a little notepad for my Mom to keep by her desk and personalized it to say "Linda's Love Notes" This design is called "Sassy Girl Stripes"
Photobooks: I created my daughter's Baby Book using Shutterfly. This was at the very top of my own Christmas Wish List in 2008. I AM IN LOVE WITH THIS BOOK. It is beautifully bound and I cry everytime I look through it. Where as all the above listed items are very reasonably priced under $20 each, this book cost a pretty penny but it is my favorite gift in 3 years! This is a great gift idea for moms, grandmas, etc. Right now, you can get a Shutterfly Free Shipping Coupon Code for orders over $30. Just enter SHIP30 at checkout. No coupon required to get 20% off calendars and 30% off photobooks right now. 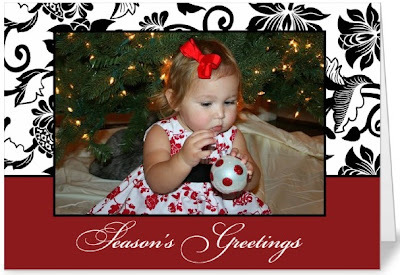 Disclosure: Shutterfly has a program for bloggers where you can receive 50 free holiday cards from Shutterfly in exchange for a post of this nature http://bit.ly/sfly2010 . No joke though, I had this post already in the works before I even heard about this (Thanks Michelle, at The Real Life Mom for the heads up). Wow! I also think Shutterfly is great. I'll definitely try to do one of these for the free cards. Thanks for the info, Jenn! !